four sweet kids..two with diabetes: Love you, Heidi. All I can properly say is I'm gonna miss that girl. She was such a loving soul. A kind heart with warm words. Day and night. I could catch her at times at two in the morning taking meds, trying not to throw up..or in the regular day like everyone else. Always with lots of love, ready to share. Never complaining in her suffering. She had a light inside that just glowed. She was Jewish, I'm not. But we shared our faith with one another, and I got to ask questions. She was so patient. When I lit candles for her in different cities, she was thankful. She always believed with me. I'm torn over flying miles away from my family, on my birthday, to make it to see her one last time. Both my grandparents on my mother's side were buried on my birthday also, years apart. Goodbye, sweet Heidi Bonn. I'm praying you are in Heaven right now. Can't wait to see you again, friend. Please pray for her family: for comfort, for healing, for understanding, and that they continue to love. Just the way she'd want it. Hugs. So beautiful... 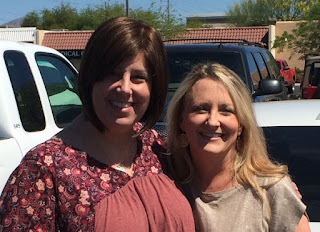 I was not one of the lucky ones that got to meet her in real life and from what I've read, I missed out, But we knew each other online and she was such an encouragement to me early on. So many loved her so much and I'm sorry for all of our losses. I'm so sorry you never had the opportunity to meet her, a truly kind and lovely person. She would've hugged you and loved you from minute one. Glad you got to share her heart online. She was an absolute encouragement, you're right!! I'm sorry for your loss also. Hugs, Joanne. Back to School, BBQ, and Baseball..and a 600.